John Pfeifer from Springfield, Ohio, was a remarkable inventor. He has taken out some sixty patents on calculating machines, cash registers, change makers, grave vaults, dictaphones, morgue tables, automatic curtain-hangers, signal devices, locks for automobiles, wrapping machines, and many others. 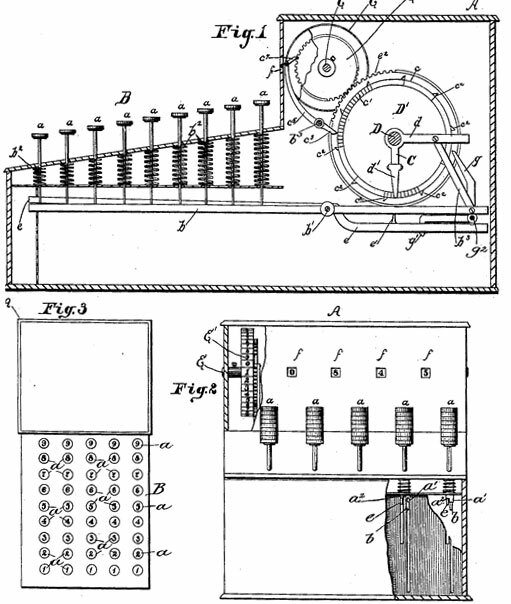 Pfeifer's first patent for adding machine (US400359) was granted in 1889 (see the patent drawing below). It was for a 5-column keyboard adding machine. As each key is depressed the counting-wheel corresponding to the operating-lever of said key is moved a number of notches represented on said key. As each counting wheel is revolved the number of notches which it moves is registered at the opening f. When either counting-wheel moves 10 notches, the next succeeding counting-wheel and its indicating-wheel are moved one notch. In adding a column of figures the key in the units-row corresponding to each figure in the units-column is depressed, and the result will be registered by the indicating-wheels through the openings f. The keys in the tens-row corresponding to each figure in the tens-column are then depressed with a similar result, the indicating-wheel of the units column remaining unchanged while the other indicating-wheels are moved corresponding to the numbers on the depressed keys. The operation is continued for each column representing hundreds, thousands, etc., the result of any addition being disclosed by the indicating-wheels as they appear at the openings f above and in front of the keyboard. 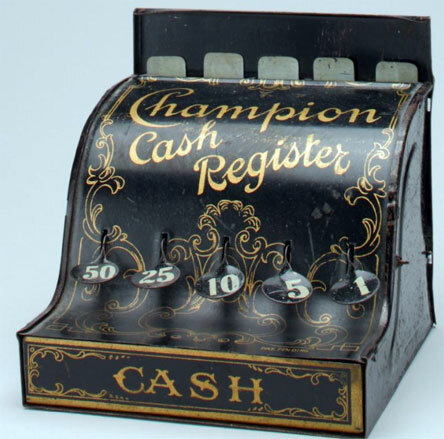 In 1900, while in his home city, Springfield, Pfeifer organized a company for the manufacturing of a portable cash register, so called Champion Cash Register (see the image below), which was invented and patented by him in late 189os (US patents No. 579604 and 628961). Three years later he sold his interests to the Mast & Foos Company and joined this company in the capacity of superintendent of its cash-register department. One of Pfeifer's patents for adding machines (US No. 1663726) was put in production in 1920s in the adder Little Giant (see the image below), made by Kel Sun Mfg. Co. in Dayton, Ohio. Little Giant was shaped like a cash register, and features a small wooden case with dimensions: 16 x 14 x 13,5 cm. Who was this exceptional inventive talent—John Pfeifer? John Pfeifer was born at Springfield, Ohio, on 9 June, 1866, the second son of Charles (1843-1895) and Elizabeth (1846-1920) Pfeifer (nee Berg). Charles (Carl) and Elizabeth (Elisabeth) were born in Germany, and emigrated to USA in 1864 together with their just born son—Peter (b. 1863). Initially they settled in Pennsylvania, but then established their home at Springfield, Ohio, where were born their next children—John (1866-1939), Caroline (1868-1942), Lizzie (1870), Maggie (1872), Adam (1875), and Fred (1877). In Springfield, Charles Pfeifer, a skilled blacksmith, entered the employ of the Mast & Foos Company, in the large machine-building plant of which he held a position as foreman for many years, until his death in 1895. John Pfeifer studied at the public schools of Springfield, and took courses in bookkeeping and mechanical drawing, under the direction of private instructors. In 1881, at the age of fifteen, he entered upon an apprenticeship in the tool-making department of the St. John Machine Company, at Springfield. Four years later he went to Cincinnati and entered the employ of the Eclipse Sewing Machine Company, but within a few months he transferred his services to the Dueber Watch Works at Newport, Kentucky. In 1887 he took a position with the Fay Watch Case Company, at Sag Harbor, Long Island, New York, where he won his first assignment as a foreman in the tool department. In 1900 Pfeifer returned to Springfield and became foreman of the tool room of the St. John Sewing Machine Company, but two years later he went to Dayton and entered the employ of the famous National Cash Register Company of Patterson, in the tool department of the plant of which he spent the next five years. He then re-entered the employ of the St. John Sewing Machine Company, and a year later he returned to Dayton with the National Cash Register Company, for which company he thereafter did important research and experimental work. On his return to Springfield Pfeifer organized a company for the manufacturing of the Champion Cash Register, which was invented and patented by him in late 189os, but three years later he sold these interests to the Mast & Foos Company and joined this corporation in the capacity of superintendent of its cash-register department. 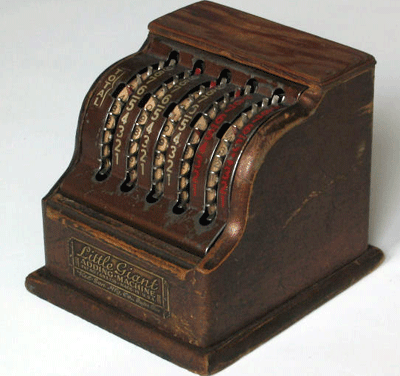 Two years later the company sold its cash-register business to the Toledo Computing Scales Company, and with the latter company Pfeifer continued his connection for the ensuing nine months. From Toledo he then returned to Springfield, and after here being in charge of the tool room of the Foos Gas Engine Company two years he became superintendent of the Standard Trimmer Company of this city. A year later he resumed his alliance with the Foos Gas Engine Company, as foreman of the tool room, and he was advanced to the office of general superintendent of the plant, a position which he retained five years. In July, 1920, Pfeifer organized the Springfield Auto Lock Company, which developed an important industrial enterprise in the manufacturing of automatic automobile locks and other devices likewise invented and patented by him. In 1889 John Pfeifer wedded Lillian (Lillie) Bauer (1865-1947) from Cincinnati, a daughter of Frederick Bauer. In 1890 was born their only child—Hazel (1890-1972). John Pfeifer died on 29 April, 1939, and was buried in Ferncliff Cemetery, Springfield.